Cider was responsible for early 'environmental preservation' in Milton. 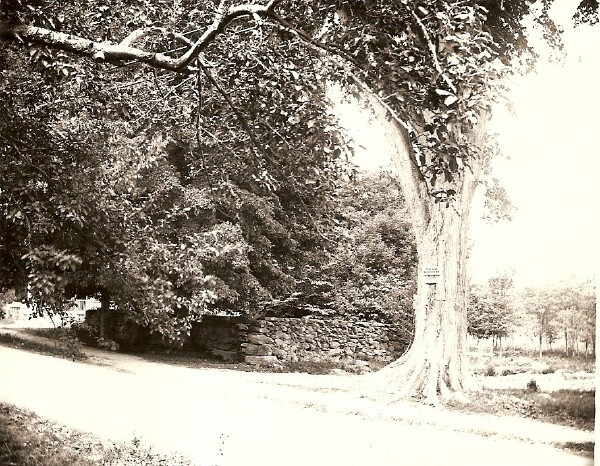 Thanks to Polly Vose and her cider, the old Gulliver Elm, which once stood at the corner of Elm Street & Canton Avenue, was saved from the axe soon after the Revolutionary War. Hearing the blows of the axe, Polly offered the workmen who were cutting the tree a glass of cider, asking them to not cut the tree down until she could see the Selectmen. The elm carried scars of that encounter until its removal in 1941. The slice of the Gulliver Elm in the Society's collection bears a hand-written correlation of the tree's rings to people and events of American and European history, stretching back to the fifteenth century. Click on the image above for a closer view of the section around the year 1500. Below is a photo of the tree in place taken by Margaret Sutermeister.